The movie will be a lively entertainer in which these three elements-soccer, samosas and the Brazilian samba dance-will figure prominently. 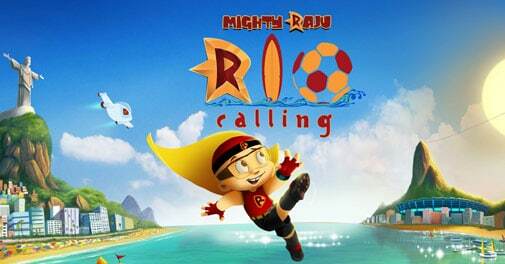 Hyderabad-based animation company Green Gold Animation will start work on a new animation film "Mighty Raju Rio Calling" on December 1. The movie is slated for release in May 2014. "The film will have soccer, samosas and samba," says Green Gold founder Rajiv Chilakalapudi. He maintains it will be a lively entertainer in which these three elements-soccer, samosas and the Brazilian samba dance-will figure prominently. The production budget for the movie is pegged at Rs 4 crore. This does not include marketing expenses, which are still being worked out. This comes after "Chhota Bheem And The Curse of Damyaan" in 2012 and "Chota Bheem And The Throne of Bali" this year, the two successive theatrical releases of "Chota Bheem," the popular character on kids' television channels. But why Raju, not Chhota Bheem? "We wanted to present a movie around a modern day superhero in a contemporary setting that could connect with a newer audience.....we also wanted to take a risk with new character for the theatrical release as against Bheem, which is more periodic as a character....We also have to look beyond our constant safe bet which is Chhota Bheem," he says. The animation film although made in India has the backdrop of Rio de Janeiro. The production team has been to Rio and researched the place well, according to Chilaka. The company has a focus on related merchandising business. It is a business that has been growing for Green Gold. "Merchandising has been growing in terms of revenues at around 20 per cent every year," says Chilaka. Today, it has 31 merchandising stores in across some 20 cities and towns including Chennai, Ranchi, Bangalore, Hyderabad, Mumbai, Kolkata and Delhi. Last year, he says, Green Gold's revenues stood at Rs 35 crore revenue. This year he expects revenues to cross Rs 40 crore. There are challenges for the Indian animation industry, largely in terms of inadequate state backing, unlike in many East Asian countries. But Chilaka however, remains optimistic on the prospects for animation movie makers in India. "We have to build the appetite.... it will not happen overnight," he says. Also, according to him, many studios in the country are taking up India-focused work. Many kids channels are making more local content. This, he says, has been an encouraging trend over the last year. Indian studios did substantial work on children's animation shows on television such as Chhota Chintu Bada Feku and Motu Patlu. Green Gold also worked on Chhota Chintu Bada Feku.